The Flying Phantom has been chosen by Roman Hagara and Hans Peter Steinacher as the vehicle of choice for the Red Bull Foiling Generation 2015. This global sailing series kicks off in Japan in April 2015. Following the Red Bull Youth America's Cup, the new regatta series in 2015 will take in seven countries and be contested by the world’s best young sailors aka, the Red Bull Foiling Generation. 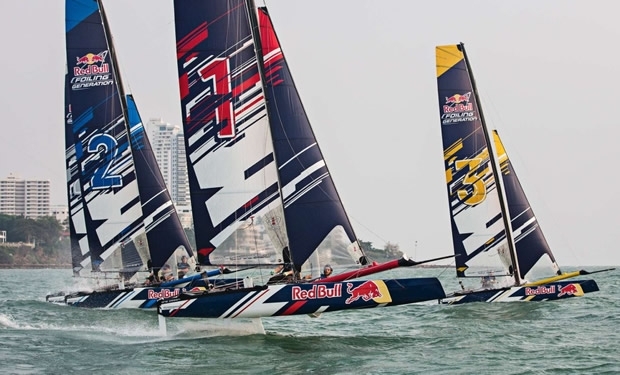 The Red Bull Foiling Generation series is open to sailors aged 16-20 who will be racing the Flying Phantom foiling catamarans, which have proved capable of reaching speeds of up to 35 knots. “We are looking for the world’s best talents”, said Red Bull Foiling Generation Sports Director Hans Peter Steinacher, inviting the new generation of sailors to take a step forward. “To fly above the water with such an 18-foot catamaran gives you a good impression of what it is like to compete in a full-sized America’s Cup catamaran,” added Roman Hagara, Director of the Red Bull Foiling Generation. After the first event in Japan in April, the Red Bull Foiling Generation moves on to the UK, Italy, Sweden, Denmark, Russia and France. The races will usher in a new sailing knockout format with four boats at the start of every race, each distinctly marked with a colour, either, red, yellow, blue or grey. The top two teams automatically advance to the next round, while the losing pair get another shot at qualifying with a lucky loser round. The draw will be further reduced in the quarter-finals before the last four go into the final, with the winner crowned the national competition winner. The winners of their respective national events will be invited to the inaugural World Final of the Red Bull Foiling Generation in 2016 to compete. Right before every event, Hagara and Steinacher will introduce the young sailors to the art of foiling and coach them. “We are offering outstanding young sailors a unique career path starting on foiling catamarans in the Red Bull Foiling Generation, the Red Bull Youth America’s Cup and the Red Bull Sailing Team competing in the Extreme Sailing Series”, said Hans Peter Steinacher of the fantastic opportunities offered by the new series.